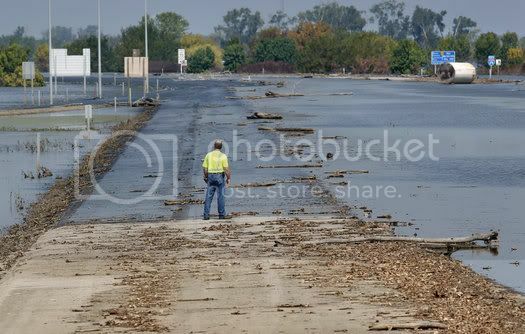 The headine in the Kansas City Star above this photograph of flooded Interstate 29 reads "The Road to Nowhere." It looks like I'll be taking the long way to my parents' house this weekend. Influences- interview with Brian Eno. Treme is about N'Orleans after the storm and is by the excellent writers of The Wire. It's in its second series on Sky Atlantic UK and in Episode 10 I just heard Drugs. One character has given up with the post Katrina struggle and has gone to be a chef in New York and drugs was in a kitchen scene Drugs being an "interesting" tune (I love it! ), I can't imagine has been on TV too often! Apart from the odd New York side scene Treme features a huge amount of great N.O. music and has served as almost a New Orleans music educational crash course for me. There are tons of guest real musicians like Dr John and I highly reccomend it. So another day, another dollar (tv broadcast royalties?) eh Chris? Keep on Drummin'! There's a new book out detailing tn NYC music scene in the 70's called "Love Goes to Buildings on Fire." You can read more about it here, along with some cool TalkingHeads stuff. Campbell presents his daughter with yet another cultural artifact that will in no way help her socialize normally with children her own age. Someone posted "Psycho Killer" on Reddit. It got tons of upvotes! Watched a movie last night called This must be the place. Fall on your face you must be having fun. Wreck-It Ralph trailer contains "Once in a Lifetime"
Cover of Heaven in the film My sister's keeper. "Take a look at these hands!" on Mystery Science Theatre 3000. I was at a three day music festival in Ireland recently called the Electric Picnic, on the second night before the headline act (The Cure) came on stage the fill in music was ''slippery people'' & ''naive melody this must be the place'' it was great to see so many people in the audience knew the songs and danced to them! A "Name the members of the bands" category on Pointless (quiz show) tonight. Sadly, no-one chose it. iRene wrote: A "Name the members of the bands" category on Pointless (quiz show) tonight. Sadly, no-one chose it. Saw that one. None of the answers were pointless it seems.